Lollipops, if you will, in two different colors. 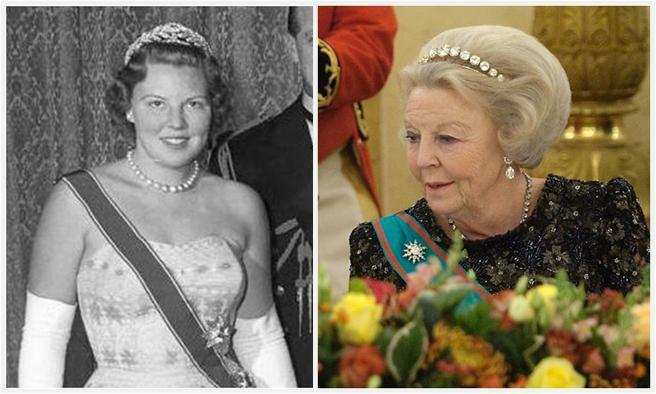 The aquamarine in particular, I think, highlights how much Beatrix's hair can cover up the bulk of a tiara. The Laurel Wreath Tiara, which may have been her 18th birthday gift, was worn mostly in her younger years, while the diamond bandeau has gained popularity in the later years - a bandeau swap, of sorts. The emerald tiara has a pearl version which the Queen has worn too, though if pearls are in order I'd prefer the Pearl Button or the Antique Pearl above. I can never decide which of these two I like best, when put in a head-to-head battle. You? Known as her favorite, and for good reason, I wonder if this will remain a Beatrix signature piece following her abdication. These have been Beatrix's two big guns, the largest in the collection that she wears (leaving, as she does, the Stuart Tiara alone in the vault). Which do you think is the better big gun for her? 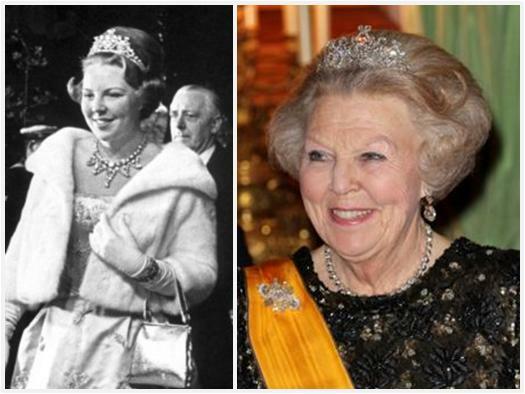 I'll be interested to see how her tiara use evolves once she ceases to be Queen Beatrix. She's not going away, of course; by law, she'll revert to being Princess Beatrix, and she'll continue to have a public life. Her mother, Juliana, was seen at the occasional tiara event and state visit following her abdication, and I hope Princess Beatrix will do the same. Which of Beatrix's tiaras is your favorite? P.S. : We'll have a look at what's to come for the big inauguration - there are some facts, and a lot of speculation at the moment - on Friday.